Maintaining proper tire pressure and tire tread not only keeps you safer on the road, but it can also help improve gas mileage. 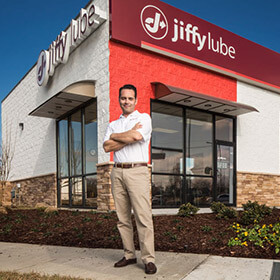 All Jiffy Lube® locations use a tire pressure gauge to ensure your tires have the ideal pressure for safety and performance. Incorrect tire pressure means tires are either underinflated or overinflated. Overinflation means the weight of your vehicle is not distributed evenly across the entire tread but is instead concentrated on a thin strip in the center. Underinflation means the tire is soft, and the outside edges work harder than the softer center. The extra rolling resistance makes your vehicle work harder to move, and it can reduce gas mileage. There are a number of issues that can easily be avoided by keeping your tires inflated properly. The tires will remain stronger, have better traction, return better mpg and last longer. Regular tire rotations may help as well, as each tire position wears differently due to driving habits and the vehicle. Underinflated or worn tires can be dangerous. Underinflated tires create extra friction where the rubber meets the road, generating heat in the tire that degrades their structure. It also makes the tread wear faster and unevenly. This impacts the vehicle's traction and can possibly lead to dangerous blowouts. Properly inflated tires also provide better cushion between the tire rim and obstacles like potholes or curbs, reducing the risk of damaging a wheel or knocking the suspension out of alignment. Tire pressure should be checked regularly and filled to the recommended level, which is for a “cold” tire. This information is usually located in the vehicle owner's manual or on a sticker in the doorjamb, trunk or glove box. Correct tire pressure is vehicle-specific, not tire-specific, so do not use the pressure listed on the sidewall of the tire itself. That’s a maximum the tire manufacturer cites for all uses, not necessarily the same as the pressure recommended for your vehicle. Tire tread simply helps provide traction, especially in wet or icy conditions. An easy way to see if the tread is worn out is the “penny trick.” Insert a penny into the tread groove with Abe Lincoln's face showing, but with his head upside down; if you can see all of Abe Lincoln's head, it's probably time to replace your tires. Modern tires also include “wear bar” indicators that create a cross-tread pattern when the depth is down to 2/32-inch. When you see those, it’s past time to replace the tire.